Truman and MacArthur, Adversaries for a Common Cause, by Mr. Donald J. Farinacci, http://www.facebook.com/pages/Scrivener-Literary-Productions-Books-by-Donald-J-Farinacci/346933663716 is an elegant political biography of two men who unwittingly reinforced a principal of the American fabric by engaging in a confrontation that ended both their public careers. Steering an uncharted course between nations whose armies and navies were subject to a king, such as England, and nations whose armies and navies were subject to no one, such as Barbary, the American founders chose to provide for armed services whose commander in chief would be elected by the voters, not installed by the ranks. The price of American democracy is that, from time to time, the commander in chief will have never been a soldier or sailor. As Mr. Farinacci points out, history is hard on the general who fails to respect his chain of command. One hundred fifty years before President Obama fired General McChrystal for disrespectful invective of his president, a similarly-untested President Lincoln summoned George McClellan, the commander of all Union forces, to the White House to dismiss him from command in the middle of a civil war. However, it is the dismissal of the most popular commanding general in modern United States history, Douglas MacArthur, by one of the most unpopular presidents, Harry Truman, that Truman and MacArthur so convincingly portrays as the product of a country divided between its elected leaders and its isolated general whose reputation at that time owed more to his leaks to the press than to his conduct of battle. Harry Truman became President by accident, first from the ruckus of a 1944 Democratic convention in which he emerged as the vice presidential candidate to a dying President Roosevelt, then by being the last man standing in 1948 after Republican opponent Thomas Dewey snatched defeat from the jaws of victory. Douglas MacArthur became America’s face of military superiority, the general who as commander of Allied forces in the Southwest Pacific marched brilliantly up the rim of Asia in World War II, recaptured New Guinea and the Philippines, then administered occupied Japan in the aftermath. But, in 1950, North Korean troops overran South Korea. MacArthur reversed that loss with an ingenious invasion at Inchon, then threw the spoils of victory away by ignoring all intelligence that showed masses of Chinese troops ready to invade if his troops rolled north. Politically, Truman was concerned that the Korean conflict could break out into an Asia- wide theater of war while the Soviet Union was pressing at every European border; MacArthur wanted exactly that, and by a mixture of ignoring orders, acting on his own, and failing to grasp the extent of the Chinese threat, nearly got it. With great skill, Mr. Farinacci describes what happened at the only meeting between the President and the General: “The general’s appearance, manner, and breach of protocol bespoke an attitude that no one in the United States hierarchy was above him.” He suggests that Truman would have let it pass had MacArthur also been reliable – the stability of Korea was at stake, not the president’s patience- but MacArthur was not. The general told the president that the Chinese could not employ more than 50,000 troops and no air force and, thus, there was no chance that China would attack MacArthur’s divided forces, which a quarter million Chinese did about one week later. Truman and MacArthur is a very wise look at both men as well as the events that led to Truman ultimately firing the general. Weaving their respective histories in chapters devoted to each’s personal career , Mr. Farinacci retraces enough of their pasts to credibly argue that the confrontation was inevitable. MacArthur, the son of a Civil War officer who became Governor – General of the Philippines, pursued generals’ stars and public recognition of his undoubted skill for his entire career. He graduated first at West Point and went on to organize and command the Rainbow Division in World War I France, reorganized West Point, and became Chief of Staff under President Hoover. However, it was not MacArthur but Truman who led an artillery battery through the worst of the Argonne offensive and brought every one of his men back home alive. In the course of doing so, Truman was subjected to public humiliation by a superior officer for resting his men on a forced march between battles, an event that Mr. Farinacci suggests prepared Truman to be tolerant of his officers yet capable of firing them when they went too far, as he did three decades later. It would be going too far, however, to reveal the balance of this well-written book. Drawing on both academic and popular sources, Truman and MacArthur brings the history of this gripping confrontation full-circle. In the end, Mr. Farinacci reminds us that the line between military commander and civilian commander in chief is not an easy one but, nevertheless, one drawn by the Constitution that serves our democracy well. It is an exceptional and timely book, a well-written analysis of a difficult period in American history and of a war that, six decades later, calls out for serious study. 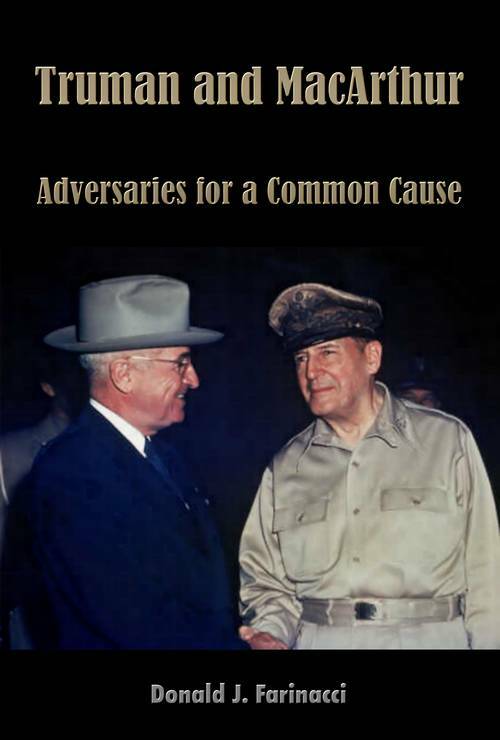 Truman and MacArthur: Adversaries for a Common Cause (2010), Merriam Press, hard cover $36.95, paper back, $19.95.